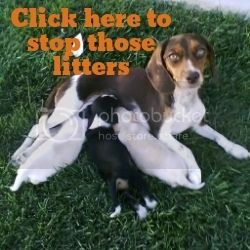 STOP MOTHERS DAY, Sponsor a Spay! 6 to 8 million cats and dogs enter animal shelters every year nationwide. Only about 10% are spayed or neutered. A fertile cat can have up to 2 litters per year, averaging 4 to 6 kittens per litter. Up to 4,948 kittens can be born from one unspayed female cat and her offspring in seven years. A fertile dog can have up to 1 litter per year, averaging 4 to 6 puppies per litter. Up to 508 puppies can be born from one unspayed female dog and her offspring in seven years. An estimated 3 to 4 million cats and dogs are euthanized every year nationwide. For only $80, you can help us stop pet overpopulation and the needless euthanizing of cats and dogs. In May to honor our furry four-legged mothers, save a life and sponsor a spay TODAY! !